Bologna is a city in the Emilia-Romagna region of Italy which, as with much of Italy, is full of points of historical interest. For better or worse the city is often overlooked by the millions of tourists that flock to Italy every year, however, this should not detract from Bologna’s importance. The city is home to the oldest university in the world (founded in 1088). 180 towers, of which 20 or so are left, are said to have dotted the city’s skyline at the height of Bologna’s power which must have made it look like a medieval Manhattan. However, Bologna’s architecture and academic history are not the only remarkable parts of its history. The city can also be described as the true symbol of freedom as it was the first city in the world to abolish slavery. In the 13th century Bologna was caught up in the wars between the Guelph and the Ghibelline factions (more on that confict in The War of the Oaken Bucket). In 1249 the two factions, in the form of Bologna for the Guelphs and Modena for the Ghibellines, clashed at the Battle of Fossalta. Despite being outnumbered nearly 2:1 the Bolognese were victorious and managed to capture the enemy commander, Enzio of Sardinia. Enzio and roughly four hundred of his knights were paraded through the streets of Bologna. The Holy Roman Emperor offered a ransom for the captive Sardinian king but the Bolognese would not release him. Enzio would live the remainder of his life in Bologna in the palace that now bears his name, the Palazzo Re Enzo. In an interesting aside: legend has it that Enzio fathered a son during his captivity with a peasant called Lucia di Viadagola. The son was called Bentivoglio and his family would go on to become the rulers of Bologna. The Battle of Fossalta, however, did not change the political landscape of Italy in any way and the Bolognese had paid a high price for their victory. The losses on both sides had been heavy but Bologna’s aristocracy had suffered greatly (for them the losses of the battle made it tantamount to a defeat). 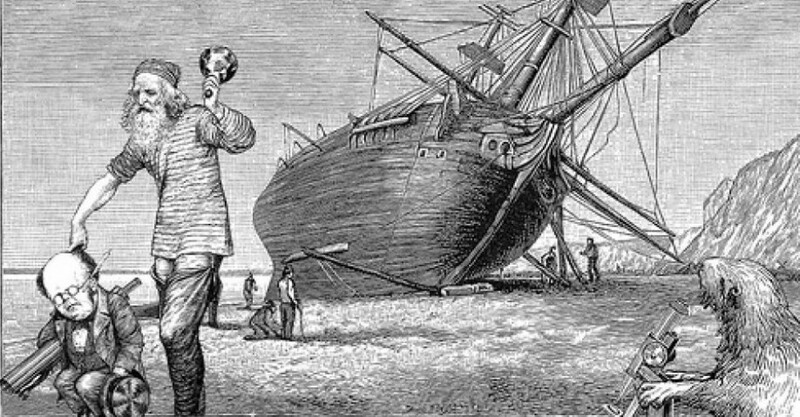 The result was that the lords were forced reexamine their relationship with the serfs which could no longer be maintained due to their reduced power. The issue also had an economic dimension to it as the city was verging on bankruptcy and needed new sources of revenue. Freemen were considered to work better than serfs and their incomes would be taxable by the commune of Bologna. On the 25 of August 1256, in Piazza Maggiore, the head of the Bolognese government, Bonaccorso da Soresina, announced the emancipation of the 6000 serfs, and the compensation to be paid to the 400 lords who owned them. The compensation would be given according to the market price: 8 silver lire for a child and 10 for an adult. In the beginning, Lord God Almighty planted a garden (paradise) of delights. In it He put the man which He had formed and He adorned his body with the garment of whiteness, giving him perfect and everlasting freedom. But this miserable creature, forgetful of his own dignity and his divine gift, and in spite of the Lord’s precept, ate the forbidden apple. In so doing, he miserably brought himself and all his descendants into this valley and greatly poisoned humankind by miserably binding it with the bonds of diabolical servitude: from being incorruptible, it became corruptible, and from being immortal, it became mortal, subject to this change and to a very great servitude. Seeing that the whole world was withering, God took pity on humankind and sent His only Son, born of the Virgin Mary through the workings of the Holy Spirit, so that, having broken the bonds of servitude which held us captive, the glory of His dignity might restore us to our original freedom. This is why, most practically, the question is whether men whom nature made and created free and whom the law of men has submitted to the bonds of servitude, shall be restored, by the benefit of enfranchisement, to that freedom into which they were born. The book now lies in the State Archives in Piazza dei Celestini, Bolognia. There is also a plaque commemorating the 750th anniversary of the first Emancipation Proclamation in the Palazzo d’Accursio, Bologna. It is uncertain if the economic reasons for the emancipationwere ever justified. 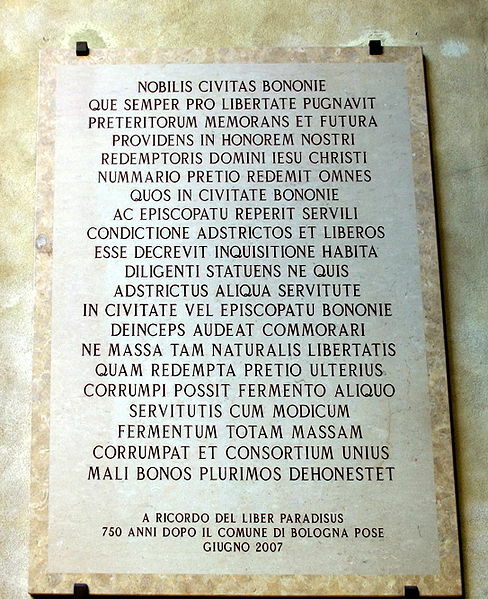 The laws of the free serfs in Bolognia forced them to remain in their diocese (Bolognia and its territory) and so restricted their freedom of movement. However, there are signs today of the legacy of this edict. The freed serfs tended to gather in communities in the countryside and would add the word franco (Italian for free) to the name of the place. e.g. the town of Castelfranco Emilia. ← Yamada Nagamasa: A 17th century adventurer, pirate and merchant.